SAN DIEGO — The San Diego Sport Innovators (SDSI) and Padres Pedal the Cause have teamed up to spotlight the breadth and diversity of the local bicycling and sports industry by hosting the Second Annual San Diego Sport/Cycling Showcase on Saturday, February 4 from 10:00 a.m. to 2:00 p.m. at 350 10th Avenue, San Diego. 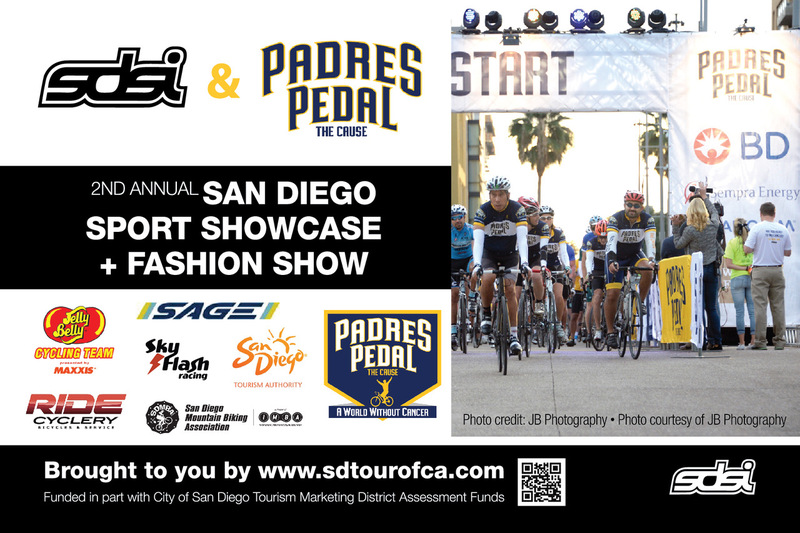 San Diego cycling and sport brands participating in the Showcase include an exclusive group of brands and partners: 2XU, SAGE Titanium Bicycles, Lumos Helmets, e-JOE Bike, San Diego Mountain Biking Association, Cuba Bike Travel, NiteRider, Deco Bike San Diego, ASSOS, Adrenaline Cycling, Ride Cyclery, Eliel Cycling, Belgian Waffle Ride 2017, GQ-6, SDSI, Padres Pedal the Cause, Mesa Rim, Jelly Belly Cycling Team and SkyFlash Racing. The highlight of the Showcase will be a Fashion Show featuring the newest men’s race cycling clothing by team Jelly Belly, and women’s styles worn by Skyflash Racing. The event will also celebrate the grand opening of RIDE Cyclery’s new downtown location. There will be food and entertainment for attendees. Announcements will be made about the 2017 Amgen Tour of California, as well. This is the second time the sports and cycling community has come together for a brand showcase to spotlight local culture in support of the active living/healthy lifestyles. This event will introduce the top cyclist riding for Team Jelly Belly and SkyFlash, both professional cycling race teams based in San Diego County, their team clothing, gear, bicycles, sponsors, and provide interviews. “I am excited to support all local companies that support cycling here in San Diego — our home base for over 18 years of competition. Being a part of the second annual San Diego Sport/Cycling Showcase is a first for the Jelly Belly P/B Maxxis Cycling Team and which we plan to participate in for many years to come,” Danny Van Haute, Jelly Belly Cycling Team manager. “We are excited to host this event for the second year reaching worldwide audiences, online viewers, sports fans and followers of professional cycling. And providing an experience for sport and active lifestyle communities that is unique to San Diego spotlighting the economic impact local professional teams, sport industry manufacturers and causes make on every day lives,” said organizer Ed Clancy, chairman of the Amgen Tour of California San Diego Organizing Committee. SDSI last year released a comprehensive report on San Diego’s Cycling Industry, and the numbers were impressive — $547.4 million total estimated annual revenue per year from the wholesale and retail sectors of San Diego’s bicycling industry. In the wholesale cycling and related manufacturing, there are currently more than 50 companies with annual revenues of $97.4 million. The retail sector — bikes and related cycling gear — total $220 million per year generated by 227 independent bicycle dealers, with those IBDs employing an estimated 1,226 workers. Other bike related retail activity totals $230 million with $56 million in retail salaries and wages. Padres Pedal the Cause is an annual cycling fundraising event with the mission of creating a world without cancer. 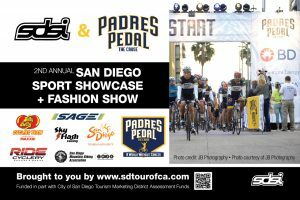 The San Diego Padres and Pedal the Cause have joined forces! The two organizations, which first partnered in 2015 and raised $1.3 million for cancer research centers here in San Diego, have partnered to make an even larger impact and pave the way for a cure. For more information, visit www.sandiego.pedalthecause.org.